Phoenix Botanicals caught my eye nearly two years ago when I bought their terrific Wild Rose Lip Balm on a whim, but I was unaware that fragrances had become a part of their repertoire as well. Irina Adam, creator of Phoenix Botanicals contacted me recently, and asked if I would like to sample some of her all natural perfume oils. Having been impressed by her lip balm, I decided to take her up on her generous offer, and I am so glad I did. To begin with, the presentation of her perfume oil is simply charming. I adore the silk ribbon around the top of the vial as if it were a bow on the forehead of a pretty flapper from the 1920’s. In fact, Saffron Veil, Irina’s latest fragrance, smells like it could be straight from that era as it sings with a smoky violet voice that’s so deep it’s inky without a trace of sweetness. Freshly puffed smoke hangs in the air, as does tobacco resin from old pipes. Saffron Veil, as the name suggests, is not all darkness as the opaque opening gives way to a lighter heart of boronia that’s tannic, but also fruity. A gentle wafting of tuberose joins the party at this point, and is also the last one to leave. The tuberose doesn’t make much of a scene though, this is a subtle one that’s happy to linger in the background, only to be noticed if you draw her in closely. And that’s how it goes with most all natural perfume oils. Phoenix Botanicals’ fragrances are in a base of organic jojoba oil, wear very close to the skin, and on me, last just under a few hours. Irina also sent me samples of Bonfire Rose, Meadow & Fir, and Amber & Blues. While I found Saffron Veil interesting, Bonfire Rose left me the most impressed. Like Saffron Veil, its top notes are shadowy and smoky, and I enjoy those initial moments of secretive intrigue which contrast against the lighter and brighter top notes of many other perfumes. Bonfire Rose takes a minty, resinous turn that’s mildly rosy, but not what I would call overly floral in the slightest. It brushes up against charred sage and lingers around camphorous leaves, evoking memories of woodland strolls and crackling campfires. Amber & Blues and Meadow & Fir both reside squarely in the amber family. The prevailing amber triad of vanilla, labdanum, and benzoin oversees these two fragrances in a lovely manner. Meadow & Fir has fir of course, but it also has a jammy quality that reminds me a touch of Aftelier’s Fig. Amber & Blues is more of a straight-up amber, with a very pillowy, woody-vanilla drydown, not unlike Roxana Illuminated Perfume’s Lyra. I do think Fig and Lyra are more nuanced and more complex fragrances, but Phoenix Botanicals has a price point more people can afford which broadens the natural perfume community and keeps us smelling beautiful. Leave a comment and I will enter you in a drawing for my Saffron Veil (minus the ribbon and a some dabs by me for the purposes of this review). US addresses only. I apologize to my international readers. The winner has been chosen. 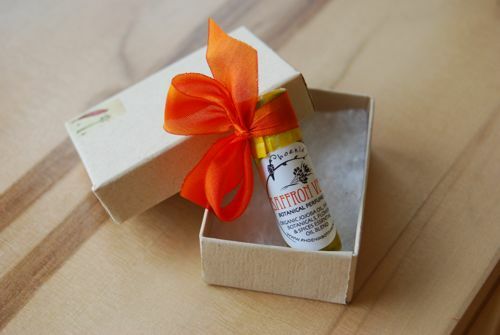 There are other fragrances to explore at the Phoenix Botanicals etsy site. $24 for 1/8oz vial. Other sizes and samples available. That sounds lovely. Please enter me in your draw. And I’m glad to see you back after your absence! Off to check out her site, and please enter me in the draw! Thank you! It’s wonderful to be reading your reviews again! I would love to try Phoenix Botanicals- they sound fasinating. Many thanks! I love Irina’s product too!! 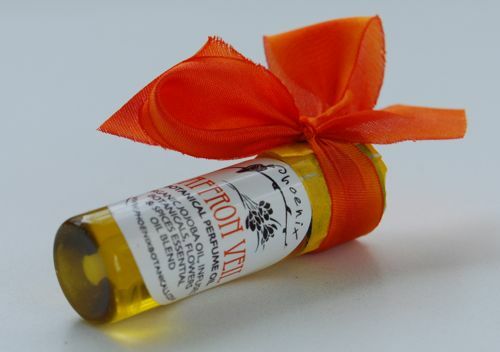 I really want to try Saffron Veil after your review, it sounds wonderful. I am always a sucker for Boronia! Blues & Amber is on of my favorites of Irina’s gorgeous skin scent and wears like a soft cashmere sweater. I agree it does have the base like Lyra(a perfume I love) but Blues & Amber wears longer on me. I also adore Meadow and Fir, the jammy aspect is invigorating and smells like a plump raspberry. I have also tried Bonfire rose. I like the smokey, resinous scent with light rose. There is also a camphorous note that dries down softly. Lastly I have tried Night Bloom. Sultry jasmine perfume that lingers on the skin. As Irina notes it invokes memories of a moonlit walks with warm tropical breeze carrying sweet narcotic florals and resins. Irina’s has become quite the perfumer, with a wonderful Apothecary. Her prices are amazing and I love the simplicity and beauty of the packaging. Absolutely one of the kindest and sweetest Etsy sellers too!! Thank you for the review Trish, looking forward to reading more!! PS. The only lip balm I have used for the last 3 years has been Irina’s, it is amazing!! Along with her butter’s for dry hands. Thank you so much for your added thoughts Angie, it’s always so good to hear from you. Night Bloom sounds lovely, I will add that to my etsy list, along with her butters! Hit sent too soon! As always, your description is lovely! Please enter me in the draw, I’d love to try this. I’m also going to check out the lip balm. I’m on a never ending quest to find the perfect balm. Give it a try! Dr. Hauschka’s lip care stick is still my holy grail, but PB’s is pretty darn good! You are so welcome! Thanks for the opportunity to give them a sniff! As always a poetic and thoughtful review. I’d love to explore this line as Naturals are what I’m all about. Sounds lovely and affordable is always a plus! Thanks for the draw. Good to see you Zee! Best of luck! These sound so nice! I’ve bookmarked them as something to try. Bonfire Rose is a really interesting fragrance. My current favorite from the line is Night Bloom. It’s a gorgeous jasmine. It’s quickly becoming one of my favorites!